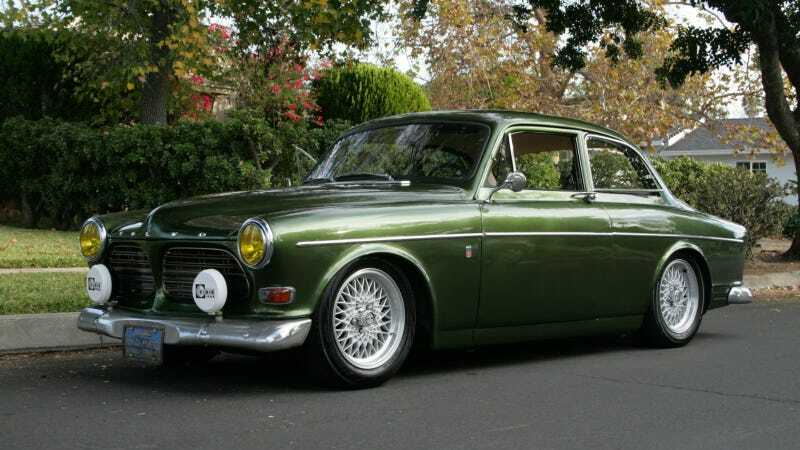 The Volvo 122S/Amazon is a 50's styled classic Volvo that (usually) doesn't cost an arm/leg to purchase, drive or restore. Today's Amazon isn't just a good deal, it is a crazy restomodded hot-rod with a turbo Nissan engine. Find this 1967 Volvo 122S SR20DET Power for sale in Mission Hills, CA currently bidding on ebay for $5,100 with a 5 days to go. Seller submission from Oprah85. Recent questionable market transactions (ahem..cough..cough $30k..what?) have suggested the 122S/Amazon market is trending upward like crazy, but the vast majority of 122S/Amazons around are still good deals. If you feel like you are experiencing deja vu - you are not alone. The car you are looking at was recently featured on DT as the "Drive It Like You Hate It" Volvo 122S. The previous ad lacked good information and didn't include a single underhood shot and pics were taken with a 1990 vintage cell phone camera. This time the ebay listing includes some glorious high resolution pics of the Nissan SR20DET under the hood. This 2.0 liter inline-4 is turbocharged, intercooled and is good for 300 horsepower according to the seller. Also under hood is a rack-and-pinon steering system and brake booster from a BWM 3-series - this thing is a real smörgåsbord of mixed parts. The interior has been freshened since the last time we saw it - those nasty green seats have been replaced with some saddle brown leather and the carpet is also new. The interior also has an air conditioning setup, but it needs a compressor installed and some charging/sorting before it functions. Suspension is setup via airbags at all four corners with a few compressors and a small air tank in the trunk. Not sure what an airbagged Amazon handles like, but it sure looks good with those mesh wheels tucked slightly under the fenders. The seller was also nice enough to include a detailed 8 minute video walk around - worth the time if you want to know more about this turbocharged beasty. Originally posted as 10k: Seller Submission: 1967 Volvo 122S Amazon With Nissan SR20DET Swap on Daily Turismo.